Fairly early on in my research for my history of ideas series on Margaret Sanger in New York City, I discover that she delivered one of her more famous addresses here in Oakland. Practically just around the corner from where I live, in fact! So I’ve long had the idea of doing a follow-up Sanger project here in the San Francisco Bay Area, certain I’d find she’s been here more than once. That turns out to be the case. And not only do I discover that she visited here several times, I find that the excellent library at the University of California at Berkeley has some great resources for filling in some gaps in my information about Sanger in NYC. So, this story will have two parts: the first part is about sites associated with Sanger here, and the second part is about some discoveries I make in U.C. Berkeley’s archives following up on two NYC sites. I head first to San Francisco, a quick and easy trip on BART (Bay Area Rapid Transit System, our subway/ell) across the Bay, and take a pleasant walk on this spring day from Montgomery Street station east, first along Post through Union Square, then on Sutter. December 16th, 1928, Sanger spoke at the Scottish Rite Hall in San Francisco, at Sutter and Van Ness. The Scottish Rite Masonic Temple moved into its new quarters in the early 1960’s, and this building became the Regency Center, a multi-purpose venue. In fact, I was here just a few years ago when I saw John Cale, one of my very favorite musical artists of all time, perform in the ballroom, but Sanger likely spoke in the Social Hall. It’s also likely she delivered more or less the same speech she delivered at Oakland Civic Auditorium three days later, the story of that speech will follow below. Perhaps the speeches and corrections she scribbled onto the speech, which I link to here, constitute the differences between her addresses at the San Francisco and Oakland venues. I write to people who manage and organize events at the Regency Center but am unable to line up a day to meet soon that will work with all of our schedules. But since I have this free afternoon on a glorious spring day, I head over anyway, in case I luck out and end up there at a good time. Turns out, the very helpful man I find here, who’s in charge of setting up events, regretfully tells me there’s just too much going on for me to head upstairs and poke around to the rooms where she may have spoken; various contemporary sources designate the venue as the Scottish Rite ‘Hall’ and ‘Auditorium’, so the exact site is unclear. So I take photos in the places he allows me to wander: the hallway, the main stairway, and a meeting room just off the main landing now converted into a small bar. About 22 years earlier, in August of 1916, Sanger wrote to her friends Charles and Bessie Drysdale, ‘In San Francisco [on a birth control lecture tour] I had a collapse, and was three days in bed under medical care, but recovered sufficiently to hold six meetings.’ As you may recall, Sanger suffered from recurrent tubercular infections, and from time to time they made her quite ill and exhausted. I have yet to find a record of specific locations she visited or stayed in San Francisco on that trip. Sanger didn’t mention her time in Oakland in this letter, though she may have meant to include the greater Bay Area when she said ‘San Francisco’, as visitors often do. Since she delivered her Oakland speech only three days after this San Francisco tour, this may have been one of the six meetings she spoke of. So I return to Oakland to follow in Sanger’s footsteps there. Baker also wrote of her outspoken opposition to Theodore Roosevelt’s beliefs about childbearing in this speech; she frequently published rebukes and rebuttals to the President’s public stances against birth control and in favor of large families. (Baker mentioned that she spoke out against Roosevelt in San Francisco as well.) Both Sanger and Roosevelt were eugenicists but of different types: Sanger believed in negative eugenics, in curing human ills through having less children, especially if the parents were ill, disabled, or too poor to bring up well-nourished, well-educated, and well-housed children, and Roosevelt believed in positive eugenics, improving the human race through intelligent and hardworking people having as many children as possible. The Hotel Oakland, which opened as a luxury hotel on December 23rd, 1912, is now a senior community residence. Its grand edifice is little changed, but its garden is no longer so sumptuous and much of its interior is much plainer, having been stripped of its chandeliers and fancy furniture and painted plain white, though the lounge ceiling is painted a lovely antique-gold color. I sign in at the desk and walk around the first floor, greeting each person I see with a hello, a smile, and a nod, everyone is friendly and welcoming, and no one questions my presence. I take photos freely on the ground floor except in the large back room converted into an activity and physical therapy area, which, it so happens, appears to be the former ballroom I seek. I ask the person who works there if I may take pictures; she’s a Spanish speaker, and I ask in that language (unforgivably clumsily, given that I’m a California native and I should be more adept) if I may take pictures. She explains that the person that could authorize this won’t be back in until Monday, so I depart. As much as I am historically nosy, I make it my practice never to infringe on the territory of working people. They have enough to worry about without wondering if they could get in trouble on my behalf. I do, however, take photos of the front lobby, in full view of everyone there who appears not the least concerned with my presence except to return my smile when they happen to catch my eye. Most of the residents are Chinese. This is no surprise since the Hotel Oakland Village, as it’s now named, borders Chinatown, and like the neighborhood in general, it is family-oriented, with visitors of all ages coming and going, often taking the elderly residents for local outings, such infirmities as they have lovingly supported by wheelchairs, walkers, arms, and hands. The parks in this neighborhood often contain large groups, sometimes very large, of older people going through the graceful, slow, deliberate movements of Tai Chi. It’s likely they include many of the residents of this hotel. The sight of these people, something like colorful wildflowers waving in the wind, something like windmills if windmills were endowed with personalities, intention, and rich history and could move deliberately to music, warms my heart on my morning walks. Next, I visit the Oakland Civic Auditorium, later called the Kaiser Convention Center, also just a few blocks from my house, near Lake Merritt. 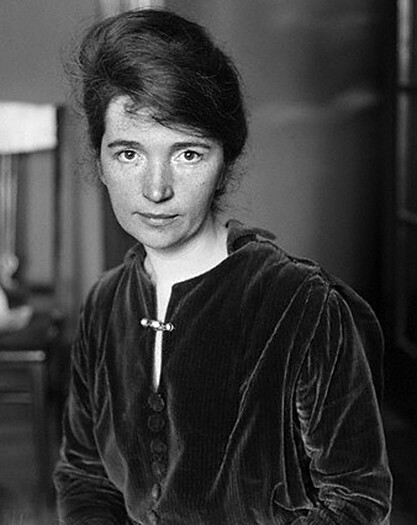 On December 19th, 1928, Sanger delivered the speech ‘The Necessity for Birth Control‘ here. It was a least as dedicated to eugenics-based arguments about the ill effects of ‘feeble-minded’, ill, disabled, and poor people having children to whom they passed down these traits and which they could not care for properly, as it was about preventing suffering. The Oakland Civic Auditorium had stood for 14 years when Sanger spoke here in 1928 and she had become very well known indeed in the dozen intervening years since she spoke at the Hotel Oakland. The Auditorium is a huge venue, as we can see in historical photos: it held Buffalo Bill’s Wild West Show and the Barnum and Bailey circus, symphony orchestras, and other large-scale entertainments. The history of this place is wonderful, with so many other amazing activists, artists, speakers, and performers appearing here over the years: Isadora Duncan, Duke Ellington, Marian Anderson, Paul Robeson, Johnny Cash, Elvis Presley, Martin Luther King, Jr, the Grateful Dead… It’s no longer in use, standing empty since just before the turn of this century, but I hope this beautiful Beaux-Arts edifice is reclaimed, restored, and put to as good a use as it once was. I finally get around to tracking down the microfilm collection, stored deep in the archives at the Doe Memorial Library at U.C. Berkeley, with the assistance of the ever- kind and helpful Nancy Oanh Tran. In looking through the microfilms of documents dated around the time of Sanger’s stay at the Barclay Hotel, I find a phone message for Sanger and many chatty letters to her husband Noah Slee written on Barclay Hotel stationery. The letters discussed visits to and from friends, a visit from her son Grant, how much less pleasant it was to drive a car in New York City than in Tucson, how disorganized she was, and so on. Most of the contents of these letters are of little interest to anyone outside of their relationship, their circle of friends, and of course, dedicated historians, except, I think, for one thing: she begs him not to join her in New York City, and not to ask her to leave her work there yet. In her second marriage, she demanded the freedom she wanted that she did not find enough of in her first, and she got it through endearments, compliments, even sappiness, so that Noah would feel loved and not abandoned; through cajoling; through explanations and arguments about the importance of her work and her need to do it unimpeded; and even through what reads to me like a guilt trip. In doing further research, I find there’s a copy of the American Eugenics Society journal also in the collections of U.C. Berkeley’s Doe Memorial Library. ‘Most of our adult generation can remember when [the birth control movement] was chiefly characterized by determined looking ladies selling The Birth Control Review on metropolitan street corners, Margaret Sanger being held up for her propaganda, and a general feeling in the lay breast that the whole thing was not quite respectable. ‘In his speech, one Dr. E. Bord Barrett, a former Jesuit and still a practicing Catholic, held out hope that the Church would be flexible and adaptable on the birth control issue. He was a believer in the social benefits of birth control, and based his hope on the fact that so many Catholics used birth control, that Church-mandated celibacy for priests and others indicated that the Church recognized it was not always in the best interests of individuals and communities for everyone to have children, and that the Church blessed marriages of couples who could not have children. Dr. Hannah Stone, director of the Birth Control Clinical Research Bureau and Sanger’s long-time colleague who was arrested in the raids on the W. 15th Street clinic, was among the speakers, but her talk was not recorded or described in Inman’s article. Ministers and rabbis voiced their support for birth control on humanitarian and personal responsibility grounds. The second day of the conference was dedicated to issues related to eugenics. They discussed the questions of whether it was desirable to ‘breed geniuses at will’, if it could be done at all; who would be qualified to decide what are ‘desirable’ human traits and types beyond those which impart health and the ability to take care of ones’ self; whether ‘spiritual values’ should be brought to bear on the issues, and much more. The article ends by noting that Margaret Sanger could not attend the conference, which surprises me! Instead, she sent a telegram which was read to the attendees since her attendance was sorely missed given her role as a founder of the movement and the most important activist of her time for women’s rights, since the suffragists. Inman predicted that birth control would become as readily accepted in society as women’s right to vote, however controversial its past. She was mostly right. Though many Americans are uncomfortable with publicly funding birth control since we believe so firmly in the right to religious dissent, most Americans actually do use birth control, at least at some point in their lives. And as Sanger hoped, it has become readily available, easy to use, mostly every cheap, and all very safe. And she played a very significant role in bringing this about. Duchsherer, Aimee. ‘Better Babies or More Babies? : Theodore Roosevelt, Margaret Sanger, and the Birth Control Movement‘. July 16, 2015, Theodore Roosevelt Center at Dickenson State University blog. Inman, Mary Louise. ‘The National Birth Control Conference’ from Eugenics: A Journal of Race Betterment, Volumes 3-4, January 1930, pp 12-17. ‘Kaiser Convention Center‘. In Wikipedia, The Free Encyclopedia. ‘The Regency Center‘. In Wikipedia, The Free Encyclopedia. It’s cold and rainy, so I spend a long morning with my coffee as I do more research. Try as I might, I just can’t identify, with any certainty, the exact site of the Queens County Penitentiary, Long Island City, where Margaret Sanger was imprisoned for thirty days in 1917 for operating her Brownsville birth control clinic. Nor do I locate the site of the original White Plains Hospital where Sanger trained as a nurse. I had pored over the atlases of that town, from that time, in the New York Public Library map division, and I searched assiduously in their digitized records this morning. No luck. So I finish my account of the first site I visited on Tuesday and publish it, then head out. It keeps raining, but oh well, it’s not a terribly long walk and besides, I welcome a walk in the rain, under my umbrella, of course. The drought back home had been mostly unrelenting for ages and it’s nice to experience a good rain again.